September 1, 2015, 11:21 AM · In an effort to promote the coverage of live violin performance, Violinist.com each week presents links to reviews of notable concerts and recitals around the world. Gil Shaham performed Bruch's Violin Concerto No. 1 with the Cleveland Orchestra. The Plain Dealer: "...this was Shaham's show, and he did not disappointment. Incapable, it seems, of an ugly or thoughtless note, the violinist made every passage sound as if it had been written for him, supplying phrases with his trademark sweetness and imbuing all with abundant and genuine emotionality. Even in the aggressive Finale, his passion was polished and heartfelt." David Coucheron performed Mozart's Violin Concerto No. 5 with the Fort Worth Symphony Orchestra. Dallas Morning News: "David Coucheron, concertmaster of the Atlanta Symphony Orchestra, was the nimble, expressive soloist in the Mozart. He began with a somewhat romantic approach, an impression reinforced by the Joseph Joachim cadenzas, but his gleaming tone gave pleasure throughout." 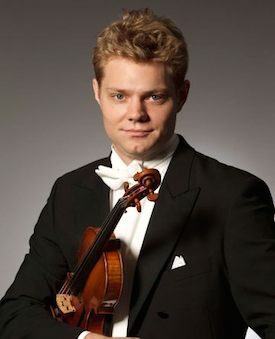 Fort Worth Star-Telegram: "Norwegian violinist David Coucheron was a striking presence in a black shirt open at the neck and shock of blond hair. Still in his 20s, he turned in a mature-beyond-his-years performance. He produced a creamy but highly focused sound out of his 1725 Stradivarius. His performance was clean, in tune and highly expressive." Alina Ibragimova performed the Mendelssohn with the Bergen Philharmonic. The Guardian: "Alina Ibragimova brought her gently luminous tone to bear on Mendelssohn’s Violin Concerto in a performance that was as deeply personal as it was authoritative, throwing in a movement from one of Ysaÿe’s solo violin sonatas as an encore." The Telegraph: "Ibragimova achieved a range of colour, from a gentle clarity in the crooning opening of the second movement to a gravelly verve in the third, and was – as you’d expect from an interpreter of Mendelssohn's idol Bach – deft and expressive with the unsupported, chordal solo sections of the first movement." Philippe Quint performed the Tchaikovsky with the KZN Philharmonic Orchestra. Artsmart: "....what made the performance memorable was the beautiful full tone he produced in Tchaikovsky’s haunting melodies. No doubt the 300-year-old Stradivarius violin which he plays (it is on loan to him) helps in this respect. His platform demeanour is also impressive, committed and passionate but natural and without affectation." Joshua Bell performed the Tchaikovsky with the Cape Town Philharmonic Orchestra. Artlink: "Bell’s tone - full and warm with impeccable intonation – rang out into the auditorium as he dug into each passage. His superb mastery of harmonics and his virtuosic dexterity over the strings were particularly evident at the cadenza, after which the slower second movement created a lush atmosphere in which Tchaikovsky’s melodic genius could come to the fore." Baiba Skride performed the Sibelius with the New Zealand Symphony Orchestra. Stuff: "...she showed a weighty rather than a mercurial style; beautiful sound but the starkness of Finland was somewhat absent." September 2, 2015 at 07:29 AM · Seeing Joshua Bell with the Johannesburg Philharmonic tonight for the first time! I'm so excited!